Using a mandoline, thinly slice zucchini into long strips. Arrange in ribbons on serving plate. Season with salt and pepper, and drizzle with olive oil. With a vegetable peeler shave curls of Parmigiano-Reggiano on top. This is quickest recipe I have ever made. It rally takes about 5 minutes. I had a couple fresh Zucchini I had bought at the farmers market and decided to just slice them thinly with the mandolin. Don’t try this with a knife unless your knife skills are as good as a sushi chef. 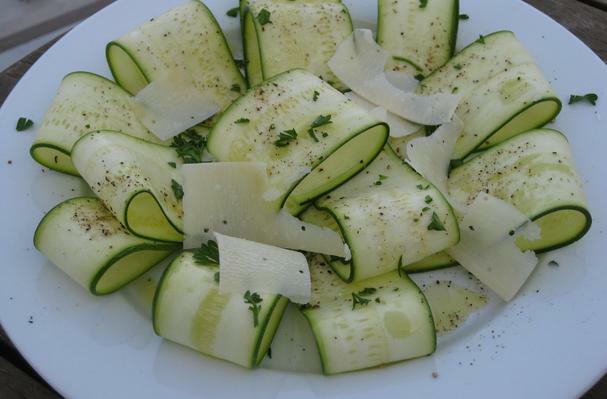 Then get creative by placing the thin slice of zucchini on a plate, top with salt, pepper a beautiful virgin olive oil, shave some Parmigiano-Reggiano and some fresh chopped parsley. Here you have it! This dish is a perfect side to a grilled meat or just as an appetizer.